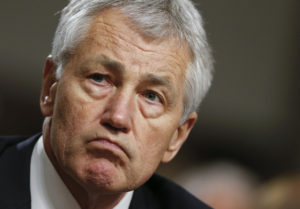 WASHINGTON — This past Tuesday, U.S. Secretary of Defense Chuck Hagel announced that the effects of the sequestration will now put civilian workers on unpaid leave for 11 days. Obama has now backed himself into a political corner over the sequester. Reuters gives the details of the policy, that most of the Department of Defense’s civilian workforce of 800,000 will be on unpaid leave for 11 days. This will be one of the most unpopular policies in the Pentagon in the past year. Reuters tries to paint a rosy picture in that it is shorter than the expected 14 days issued in March and 22 days in February, but it still is 11 days out of work. The defense budget has taken a big hit during the sequestration, where President Barack Obama tried to blame the Republicans and Congress for putting it into place. However, it was his idea after all, and now civilian workers are paying the consequences for Obama’s idea.